Two commemorative Transport Trust Red Wheel plaques were unveiled yesterday at Posset Bridge along Marple Locks and Marple Aqueduct, on the Peak Forest Canals. The plaque awards mark both sites among Britains greatest transport heritage sites. Before the advent of the railways the nationwide canal system was the main means of transport for heavy goods. The event was organised as part of the Revealing Oldknow's Legacy Heritage Lottery Funded Project. The plaques were unveiled by the President of the Transport Trust, the Hon. Sir William McAlpine Bt. Peter Stone, Trustee of Transport Trust and the Canal & River Trust Chief Executive Richard Parry were also present. Even Samuel Oldknow made an appearance! It was a well attended event and invitees reflected the project's many partners and supporters including local Councillors, Heritage Lottery Fund, Marple Civic Society, Mellor Archaeological Trust, Stockport Council and volunteers who have been part of the project. The first plaque was unveiled at Posset Bridge along the flight of sixteen locks which rise 109 feet over one mile from bottom lock to top lock. The construction of the steps leading down from Posset Bridge to the canal basin was part of the first major project that the civic society undertook in the early 1960's as part of the national regeneration of the nation's canal network. The site of the second plaque unveiling was Marple Aqueduct. The aqueduct is Britain's tallest masonry-arched aqueduct (England's tallest aqueduct). This magnificent structure carries the canal 100 feet above the wooded River Goyt valley. The Society has received a pre-planning application proposal for consultation from Emery Planning for land at 92-94 Church Lane for the demolition of the existing building and the construction of 24 residential units. This is the site of the old Albert School building. Marple Neighbourhood Plan Boundary was approved by the Stockport Council Executive on Tuesday 14th June following a recommendation for approval by Marple Area Committee on Wednesday 8th June 2016. This completes a key stage of the Neighbourhood Plan process. The Neighbourhood Forum has been set up and the management committee has held its first meeting. The next stage will be for the management committee to register the Forum membership with Stockport MBC and submit a constitution. The Civic Society has registered as an affiliate local partner to the Neighbourhood Forum. 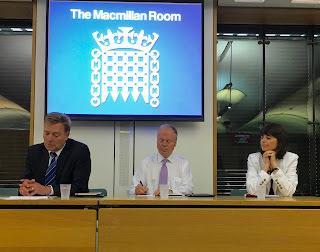 Alan and Gillian Postill represented Marple Civic Society at a joint session between the All Party Parliamentary Group (APPG) for Civic Societies and the APPG for Local Democracy in a debate on the National Planning Policy framework. The session was co-chaired by Craig Mackinley MP (chair APPG for Civic Societies), and Scott Mann MP (Vice-chair APPG on Local Democracy); the speakers on the panel were: Clive Betts MP (chair Local Government Select Committee), Baroness Parminter (Lib-Dem. Lords Principal spokesperson for Environment, Food and Rural affairs), Lord Porter (chairman of the Local Government Association). The session explored the efficiency of the Planning System and how communities can be given a greater voice in the existing planning policy. Neighbourhood Planning is being pushed up the political agenda. However, in spite of powerful lobbying by Civic Voice and others, with cross party support, a right of appeal against planning decisions contrary to Neighbourhood Plans was not included in the recent Housing and Planning Bill. Baroness Parminter said that Government has agreed to review the update process and her campaign for a right of appeal would continue. Lord Porter said that he strongly approved of the NPPF and suggested that it should put local communities at the heart of local government. He pointed out that the UK needs 250,000 new homes each year just to keep up with growth - a target that no government has achieved without direct intervention. Clive Betts commented that Planning is frequently seen as an obstacle to growth, this is not true. As an example he cited that there are 470,000 planning consents in place in England and Wales. It was suggested that frequently it is not in the developers interest to build more houses since it could force down prices. Clive Betts commented that Planning should not be seen as an obstacle but as a way for communities to shape their area. 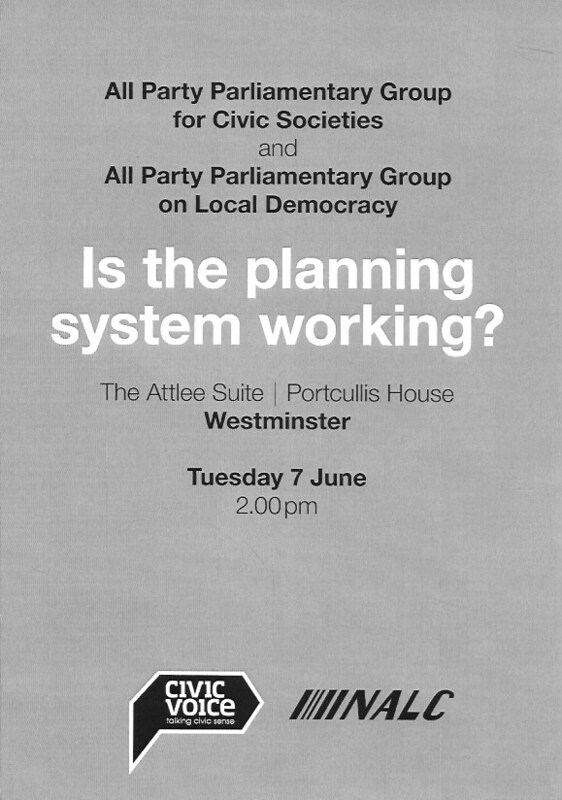 John Walker (Civic Voice Trustee) suggested that "Collaborative Planning" as proposed in the Civic Voice manifesto would speed up the planning process. At the speaker meeting on 24th May 2016 Richard Wood, Planning Policy Manager for Stockport MBC, spoke about the Greater Manchester Spacial Framework and what it could mean for Marple. Richard is involved in developing the Greater Manchester Spacial Framework (GMSF) policy and currently spends half of his working week in this area of planning. The GMSF brings together the 10 authorities of Greater Manchester to identify future housing and land requirements. A statutory joint Development Plan will be produced to manage the supply of land in Greater Manchester over the next 20 years. Richard explained that the plan is still in its early stages. The situation will become clearer once the housing allocations to the 10 authorities has been agreed. However, he identified several problem areas for future development in Marple including transport, topography, heritage and ecology. The Marple Area Committee Open Forum Meeting to discuss "Schools and School organisation in Marple" has been re-arranged and will now take place (provisionally) on 13th July 2016. The June Marple Area Committee Meeting will take place as scheduled at 6-00pm on 8th June 2016.